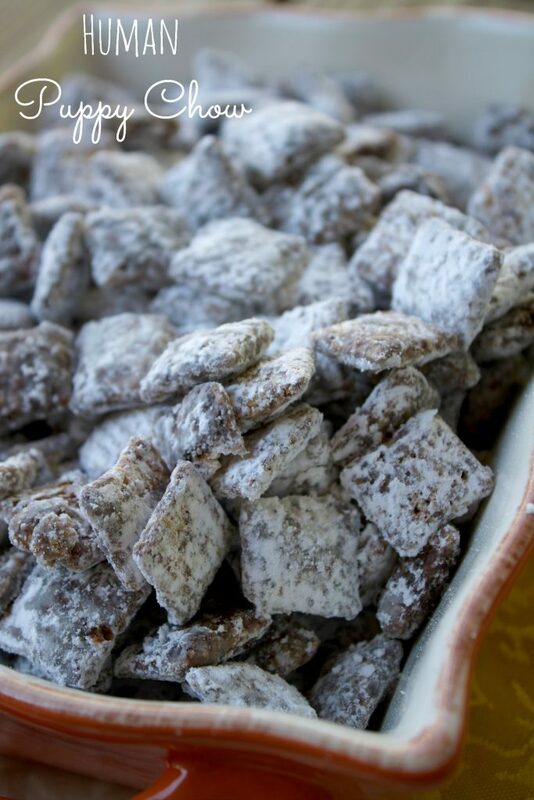 Home » SNACK » PUPPY CHOW CHEX MIX RECIPE FOR ANY OCCASION! Every year the one thing that I always make for Christmas and Halloween is my Puppy Chow Chex Mix recipe. Don’t worry, this is not the puppy chow that you are thinking. It’s a delicious chex mix recipe that combines the flavors of chocolate, peanut butter and sugar! Is your mouth drooling yet? Human Puppy Chow is a delicious, inexpensive and super easy dessert recipe to make any time of the year. I will warn you, it’s addicting. In a large bowl place your 9 cups of Chex cereal and set aside. In a medium size saucepan , melt the chocolate chips, butter and peanut butter on low heat until completely melted and smooth. Stir frequently to prevent the mixture from sticking. Remove from heat and stir in the vanilla. Pour the chocolate mixture over the dry cereal and stir carefully until it is completely coated. In a large ziplock bag pour the cereal mixture inside and then slowly add the powdered sugar. Seal the bag and shake well until all of the cereal is coated. 0 Response to "PUPPY CHOW CHEX MIX RECIPE FOR ANY OCCASION!"